Heat up your wok and get your chop sticks ready, cause this meal is begging to be made right now! If you are out of practice, you may need to take a moment and work with those chop sticks – you can do that while it is cooking. 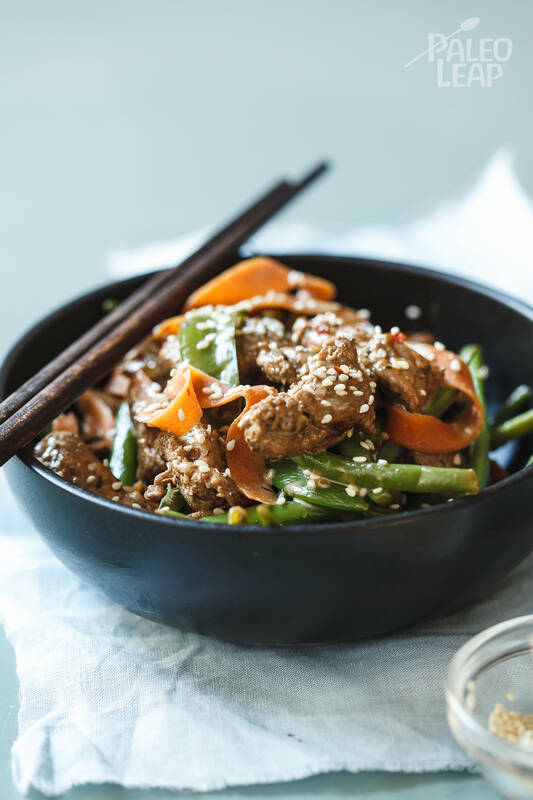 A stir-fry is a fun and simple dish that reminds us to days of take-out meals… yet the ingredients are pure and real here, and that makes all the difference in the world, especially when you are watching what you fuel your body with. Start with a chunk of quality pork tenderloin, cutting it into very thin strips, and dropping the meat into your very hot wok with organic coconut oil. Next, comes the garden fresh green beans. We are now entering a grey area of Paleo here concerning legumes. Some people can handle them, others not as much. A lot depends on where you are in the healing process, and why you switched to a Paleo lifestyle in the first place. You may not want to be eating legumes every day, but on occasion, and in the right recipe (this is the one! ), they will go down a treat. If you are up for adding more spices, why not toss in a small pinch of turmeric to the mix for some additional anti-inflammatory benefits. Pick a small amount of fresh leafy greens or chopped cilantro for decorative nutrients and dinner is ready in just half an hour. In a very hot wok or frying pan, melt the coconut oil and stir-fry the pork until it starts to brown. Add the garlic and ginger; fry for another 20-30 seconds. Add the green beans, sugar snap peas and red pepper flakes, then continue to stir-fry until they begin to soften slightly. Add the carrots and cook until just softened, then pour in the coconut milk. Season with lemon and salt; allow to cook for another minute.